Brian Garbet has composed acoustic and electroacoustic music for film, theatre, and concert. While at SFU, he was a Jeu de Temps/Times Play national prizewinner for his composition Ritual. His music has been performed by Quatuor Bozzini, Standing Wave, and Turning Point Ensemble and has received airplay and performances across Canada as well as Austria, China, Finland, Germany, New Zealand, and the United States. After years of touring and recording with the rock band Crop Circle, Brian completed his Master of Music at UBC. Currently a PhD candidate at the University of Calgary under the supervision of Laurie Radford, he has also studied with Barry Truax, Hildegard Westerkamp, Rodney Sharman, Bob Pritchard, Keith Hamel, and Allan Bell. 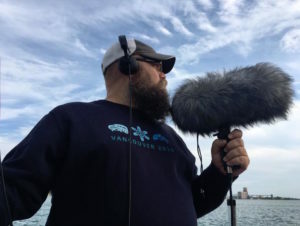 He has presented his research in Canada, England, Japan, and Korea and has been published in the proceedings of the Electroacoustic Music Studies Network (EMS) and the International Computer Music Conference (ICMC) as well as in eContact! (Canadian Electroacoustic Community). Recently, Brian returned from a research residency in the United Kingdom where he was working with Joseph Hyde, P.A. Tremblay, and Trevor Wishart.